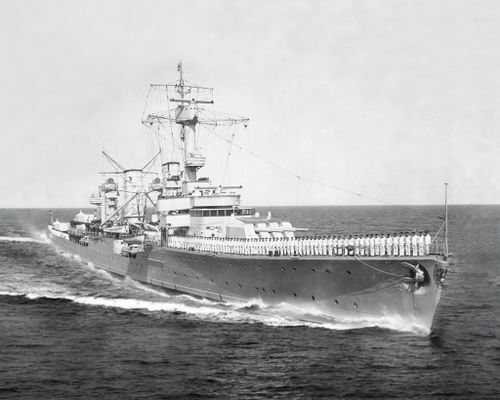 Königsberg — German Tier V cruiser. A light cruiser whose artillery and torpedo armament was quite powerful for her size. Königsberg was the first among German cruisers to be equipped with aircraft handling equipment. One of her key features was an unconventional arrangement of aft main turrets. 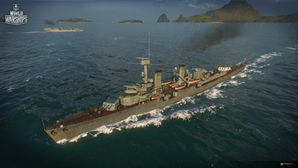 Königsberg was originally introduced to World of Warships shortly before the release of the German cruiser line in Update 0.5.0.3 through a special mission that gave players temporary access to her. She quickly made an impression, with her quick-firing, triple-barreled turrets doing horrible, unspeakable things to broadside enemy cruisers and destroyers alike. Little has changed since her release. Her potent main battery combined with her speed, handling characteristics, and improved, German variant Hydroacoustic Search ( ) ensure that Königsberg remains a solid Tier V light cruiser, even after the addition of ships such as Kirov and Emerald into the mix. New Königsberg captains should pay special attention to the disparity between her high explosive and armor-piercing shells. Her HE rounds are much weaker than those of other nations; conversely, her AP rounds deal significantly more damage than everyone else's. Königsberg can punish broadside cruisers in ways that few other ships of her tier can (only Kirov comes close). Her HE shells have a low fire chance, but are still adequate for breaking modules on enemy destroyers and lighting the fires on enemy battleships. If caught at close range of an enemy, her twelve (12) torpedo tubes — two triple-tube launchers per side — can end threats quickly... assuming she survives to deliver them. It's worth noting that Königsberg’s AP shells will still do solid damage against un-angled enemy battleships as long as they are aimed into the superstructure or casemate armor. With that said, Königsberg captains must avoid courting duels against enemy capital ships. Shells from battleship guns will wreck her in a hurry; even angled, her armor is far, far too thin to provide much in the way of protection. Her anti-aircraft armament is more for show than anything, though Hull (B) does come with a Catapult Fighter ( ), greatly increasing her defenses against enemy aircraft. All told, Königsberg is the epitome of a well-rounded cruiser that doesn't excel in any one area, but is capable of contributing in to her team in a variety of ways. Best-in-tier main battery firing range (16.5 km). Shell arc is relatively flat at medium ranges, making it a easier to land hits. Surprising AP damage that can citadel cruisers above her tier the shots are aimed correctly. Long Hydroacoustic Search ( ) range. Very flexible torpedo arrangement, similar to early American destroyers. Rear turrets can rotate 360° which makes keeping all barrels on target easier while maneuvering. Weakest AA suite amongst Tier V cruisers in the regular tech tree. Very large citadel makes it hideously vulnerable to battleships. A-XY turret arrangement can be finicky and requires some time to adapt to. Low fire chance of high explosive shells is problematic against battleships. Low armor means modules are easily incapacitated. Torpedoes hit hard, but only have a 6.0 km range. Hull: Upgrade to Hull (B) for more health, a much improved AA suite, and faster rudder shift. Research of this module unlocks progression to Nürnberg. Gun Fire Control System: Upgrade to FKS Typ 5 mod. 2 for an extra 10% range on the main battery. As is typical, Hull (B) is the better option to spend early experience gains in Königsberg. The Fire Control System module upgrade can be saved for last. There are only a few good options to kit out Königsberg. For Slot 1, Main Armaments Modification 1 is the easy choice, in order to protect her turrets and torpedo tubes while under fire. Damage Control System Modification 1 is recommended in Slot 2. Slot 3 should be filled with Aiming Systems Modification 1. The other options simply aren't worth it; her anti-aircraft suite is too weak for AA Guns Modification 1 ( ) to be worthwhile, and the remaining upgrade choices in this slot are even less palatable. Key skills for Königsberg commanders include Priority Target, Adrenaline Rush, Demolition Expert, and Concealment Expert. Königsberg captains should prioritize flags that enhance their experience gains, such as Equal Speed Charlie London ( )and Red Dragon ( ). Recommended combat flags include Victor Lima ( ), India X-Ray ( ), and Sierra Mike ( ). The wappen (coat of arms) of Königsberg. Königsberg in port; note the offset arrangement of the rear gun turrets. Königsberg on her visit to Britain in 1934; she is flying the British White Ensign and firing a salute. Königsberg at anchor in Kiel, 1937. Königsberg under attack at Bergen. This page was last modified on 19 February 2019, at 09:10. This page has been accessed 68,389 times.